We are working in an era when designers in the architectural lighting market are deluged with information that can lead to attention overload. How, then, how do we get your products in front of highly-qualified audiences that can be hard to reach? In 2010, Apparatus Design was founded as an AIA, IDCEC, IES educational lead generation program for LED lighting manufacturers and their local agents. Apparatus Design works on retainer with 8 -10 top lighting manufacturers with only one per application. The 45 - minute technical training called Innovators in LED Lighting uses your product to educate specifiers on the technical language of LED technology, and establishes brand loyalty. The presentation is continuously updated to showcase your new product technology. As part of the Innovators In LED Lighting your product is demonstrated in person to 50 - 70 highly-qualified architects, engineers, and lighting designers each month. Our personal relationships allow not only access to these clients for meetings, but also provide a two-way forum to engage with clients in order to understand their project needs. Our monthly reporting includes the leads, identified projects for your product, and a description of what’s on the boards at the firms we visit. Reports are sent to you and your local agent from our presentations in, northern California, Los Angeles and Seattle. 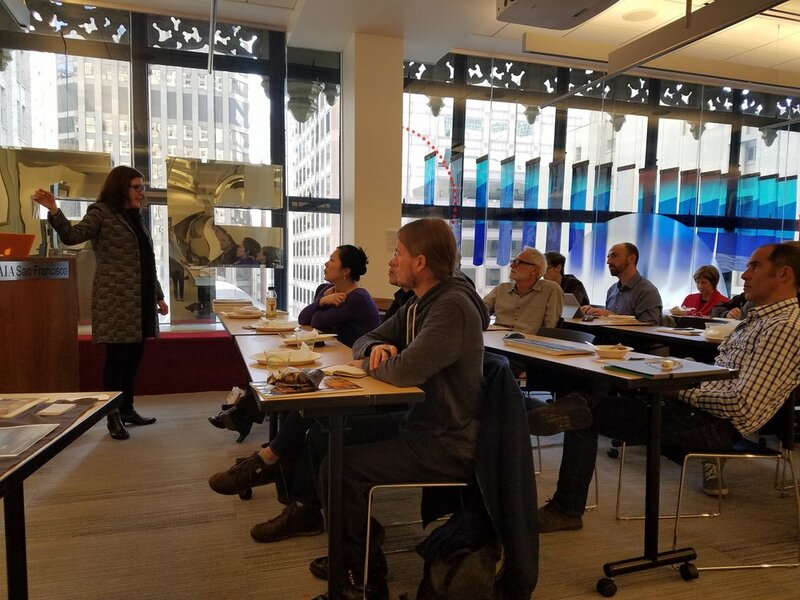 Therese Lahaie training architects and lighting designers in LED Lighting technology at AIA headquarters in San Francisco, California. Your company is one of many on your lighting agents line card and you want to keep them focused on your product. Your lighting company is new to the U.S specifier market place and needs exposure to compete with known players. You are an OEM driver or light engine company that benefits from specifier education and loyalty. Your company focus has changed, and you need to reach a new audience. For example, the product line was once residential, and now engineered for commercial applications. You want honest specifier feedback about your product. Your agents get lists of firms that do lighting design in house, where they can provide support. Your agents get a list of specifiers in firms where they did not previously have contact. Professional Association guest speaker for DLF, ASID, AIA, KNBA. Architectural lighting conference program advisor for Lightspace California. Organizer of round table events, and brain-storming sessions for manufacturers with specifiers giving product feedback. Guides foreign lighting manufacturers in understanding the U.S Lighting marketplace including resources for UL, ETL and T-24 code requirements. + "I have worked with Therese for about 3 years now and I can’t say enough good things about her." She is a smart, creative, hard worker, full of LED product knowledge and the ever-changing T24 energy requirements. She has a special knack for explaining the principles of LED lighting in simple terms and concepts that promotes our product as a LED lighting solution relevant to specific applications and job opportunities. Her presentations have opened and continue to open many doors for us. Therese comes highly recommended as a wonderful asset to any LED/lighting product manufacturer looking to expand brand awareness. Beyond the value she will add to any company by her keen ability to prospect new clients and opportunities, she has this rare and wonderful energy which I’m thrilled to have on our team representing & promoting Tech Lighting. + "Therese Lahaie and Apparatus Design have done a wonderful job teaching and educating about Solid State Lighting in the Bay Area." Since Xicato engaged with Therese about four years ago, lighting designers, engineers, architects and other constituents in the lighting field know the name of Xicato. Her educational format works to provide the audience with very useful information while simultaneously providing clients with name recognition and potential project leads. In fact this is where Therese excels. She has visited over 3,000 people in the lighting business and has provided detailed contact information for inclusion into our marketing database. While mail lists can be purchased, the names Therese provides are quality names and people who are decision makers in the industry. Her personal relationship allows not only access to these folks for meetings but also provides a two-way forum to engage with her clients to understand their project needs. Therese has provided services beyond her normal presentation and assisted Xicato is setting up meetings with key lighting designers in San Francisco and New York. Additionally she helped Xicato organize a specifier lecture and event for key lighting designers in the Bay Area. Therese organized the event flawlessly and achieved an almost 100% turn-out. + "Working with Therese and Apparatus Design has been a godsend for us at Ligman Lighting USA." Therese is an invaluable source for us in being able to reach a wide part of the specifications community that we and our agents find hard to penetrate. Therese is a trusted source by the Architectural Community and using her as source of information would be a benefit for any company looking to quickly and accurately spread their message! Monthly updates, as to time spent with the Architectural Community, keeps us the Manufacturer in-touch with what’s happening with training. Therese also keeps in contact with us for monthly updates as to the new products we frequently introduce to keep her presentations fresh & relative. Our phone conversations, with in-depth explanations, get translated by Therese into “Architect-ese” that makes perfect sense for the wide variety of specifiers that she comes in contact with. I would give her the strongest recommendation possible to any company considering her services.